Before mixing the batter, preheat oven 425. Coat a 8″ or 9″ cast iron pan with oil & place in oven to get hot. Mix all ingredients together. Spoon batter into hot greased cast iron pan. Bake in 425 oven for 20 minutes or until browned lightly on top. This entry was posted in Recipes and tagged Bread, corn, grain, pancakes, wow on January 21, 2013 by tressa. Cut the stem end of the apple, do not peel. Remove all the core and part of the pulp (save the pulp), leave the walls about 3/4 inch thick. Mix pulp, bananas, cranberries, pure maple syrup or honey and cinnamon. Fill the hole in the apples with the mixture, put 1/2 the nuts on each apple. Place the apples in a baking dish just big enough for the apples, individual size if you like. Add water to cover the bottom, bake in a moderate oven (359 to 375 degrees F.) until tender. Serve hot or cold with cottage cheese or plain yogurt. This entry was posted in Fruits, Recipes and tagged apples, baked, fruits, stuffed, wow on January 21, 2013 by tressa. needed. Remove bay leaves before serving. 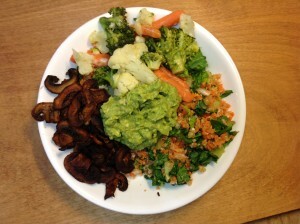 This entry was posted in Recipes and tagged stew, vegetable, wow on January 20, 2013 by tressa. This entry was posted in Recipes and tagged salad, taco, wow on January 11, 2013 by tressa. Having your whole meal setting before you is an important part of the WoW eating plan. Take time to sit and enjoy your meal. This entry was posted in Recipes and tagged platter, salad, vegetable, wow on January 11, 2013 by tressa. 1 cup of delicious cooked vegetables (baked, broiled, grilled, steamed, fried or sautéed). This entry was posted in Recipes and tagged recipes, salad, wow on January 11, 2013 by tressa.